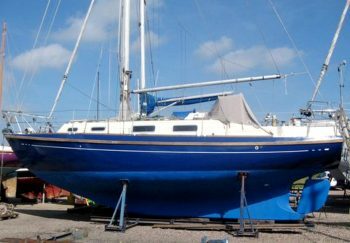 Barbican 33 GRP centreboard sloop with wheel steering. Condition: Refit completed, tidied, re-antifouled. Relaunched Mid May 2018.
with the centreboard which gives her a draft of upto 2.44m, yet as shallow as 4ft… long keel, so very comfortable and safe. Her present ownership for 16 years, she is annually taken out of the water. This Winter she is undergone a major tidy up & refit, this included the removal of the old gas water heater….Pipework remains in situ. Wheel steering from a deep open aft cockpit, she has self steering gear . Lines lead back to the self draining cockpit. Decks surrounded with guard wires and stanchions. pushpit and pulpit. grab rails on the coach roof. Decks are covered with the non slip Tracmarc. There is good standing headroom below. She perhaps needs still some cosmetic updating but as is she is very practical and user friendly. Good sized drop leaf dining table amid ships. Located under the companionway/ cockpit. GRP moulded hull built by Terry Erskin. Heavily laid up and robust hull. Decks painted cream have been laid with non slip Tracmarc. Internal ballast keel. Keel hung rudder wheel steering. dinette arrangement on the starboard side. Single quarter berth runs under the cockpit with the Navigation station above on bulkhead. Opposite (portside) is the galley: gimballed 2 burner gas hob with grill and oven. Stainless steel sink with pressurised electric pumped hot and cold water. A fridge with 240v/12v supply and a built in cooler box. aft of the sink is a hanging wet locker. 2 x winches in the cockpit for the centreboard wire and one for the jib reefing. 2 x spinnaker poles 1 light in the rig another heavier one is stowed on deck. Stainless steel standing rigging replaced 5 years ago. Sheets and ropes of varying materials. Main sail by Lucas with lazy Jacks slab reefing and a cover. Wheel steering form a compass pedestal. Wind indicators in a panel over the cockpit companionway hatch. steering compass wind speed and direction indicators and a radar reflector. Fire extinguishers, expiry dates unchecked. Fitted vented self draining gas locker in aft deck space.